Do you want to use your Google ChromeCast in a hotel room or use a paid WiFi hotspot on more than one device? What if I told you I found an easy way costing less than $20 to do both? Connecting ChromeCast to hotel internet is a problem because most hotels require you to login to their internet access via a web browser and ChromeCast doesn’t have a browser. Sharing a paid hotspots with more than one device is a problem too, but for different reasons. Whether in a hotel, coffee shop, an airport or convention center with paid WiFi Hotspots, connecting more than one device can be expensive. Available Virtual WiFi Router software helps solve the problem. Some of this software is free, and some you will have to pay for to download and use. 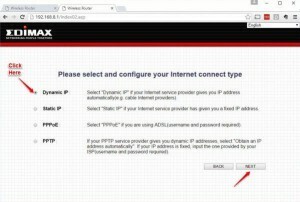 Virtual router software works by allowing you to connect your laptop computer to a hotspot and rebroadcast the WiFi signal to share its internet connection with other devices. The problem with allot of this software is your wireless adapter only has one radio designed for a single connection, your laptop computer to an internet access point. October while in San Francisco, just by pure chance, I stumbled upon a small device that will allow you to share a hotspot connection with other wireless internet devices. I found and bought the EdiMax Travel Router at Fry’s Electronics for less than twenty bucks. What’s nice about this little thing is it has WISP, Wireless ISP mode. I’ve used travel routers with WISP in the past, but as with virtual routers, none of them worked that well. The EdiMax Travel Router works very well and is remarkably simple to setup! 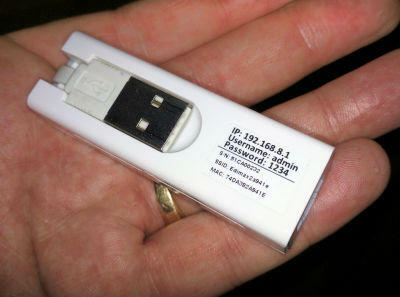 It has become my primary travel router and is a little bit larger than a flash drive. It’s powered by USB making it very flexible to use as a travel router. I’ve recorded a video of these instructions and is located at the end of this article. It’s best to do the initial setup at home where you are confident your own internet access is working. 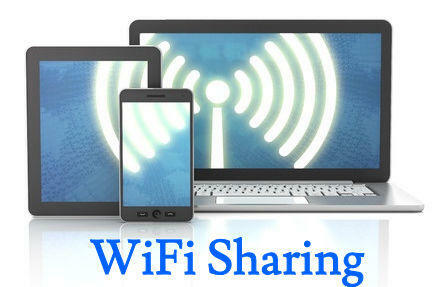 When traveling, it’s too easy to connect to a WiFi signal that’s not attached to the internet such as a wireless printer. 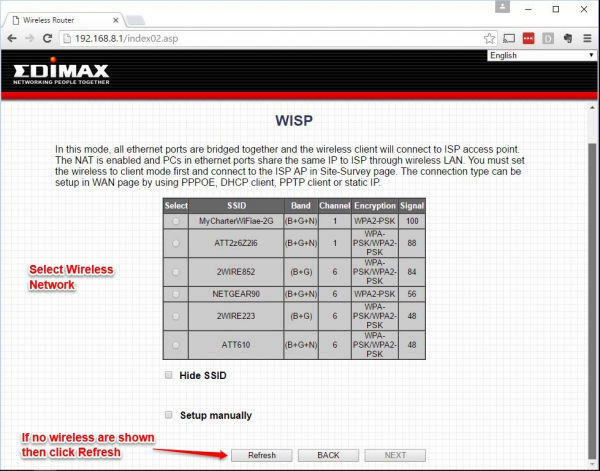 The only changes you need to make to the EdiMax Router is during the initial setup. The router will address the core wireless settings and wireless security settings. All the other settings are best-left set to factory defaults. This keeps things simple and ensures the device works well. Connect the device to a USB power supply and wait for it to boot up. During boot up, the blue status light will flash for about 3 minutes. After this time and the blue light is steady, the EdiMax Travel Router will be broadcasting its open default WiFi Signal. 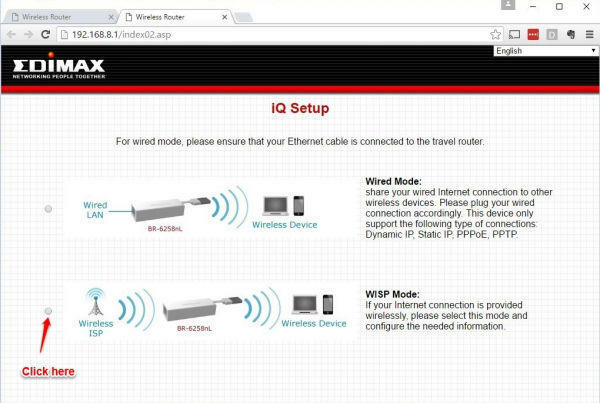 key into the address bar: http://192.168.8.1 for the IQ Setup page. This is the routers default IP address. Again, I like to keep things simple, so I’ve not changed mine. 4. 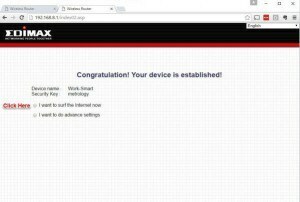 On the IQ Setup page, enter a device name of your choosing. This will serve as the wireless SSID once the router is setup. 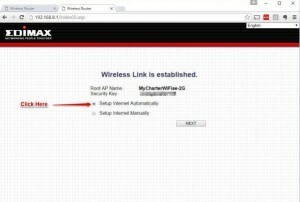 Next, enter a wireless security key of your choice, the router will default to WPA2 wireless encryption. Again, I left the security encryption type unchanged at WPA2. It works well, and I don’t see any point in changing it. 5. 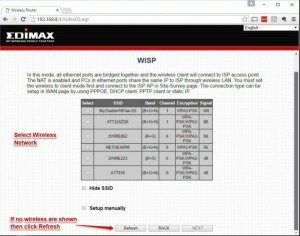 Click on next and wait for security settings to save and the router reboot. It’s important you don’t close your browser during this step. 6. After a short while, a message will appear on your web browser asking you to connect your computer to your device name you choose in the previous step. Then enter your password and click on connect. This completes the initial setup, and now the EdiMax Router is ready to connect to a wireless ISP. 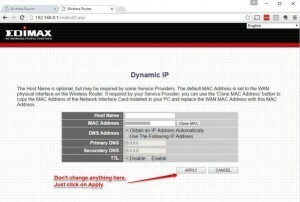 Connecting the EdiMax router to an ISP is just as easy and straightforward as the initial setup. 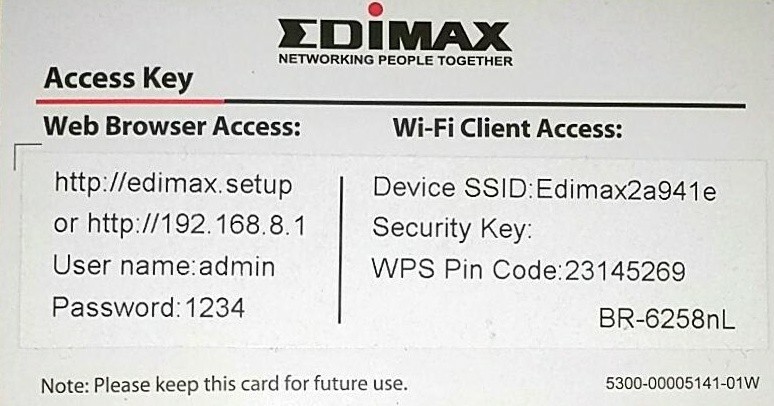 One very cool feature of the EdiMax is when it’s powered up, if it can’t connect to the ISP it was previously connected to, it will automatically display the connection screen. If the connection screen does not display automatically, just open your web browser and key into the address bar for the connection screen to appear. 1. If not already powered up, plug in the EdiMax to your USB port or USB power supply and wait for approximately three minutes or until the blue status light stops blinking. 2. 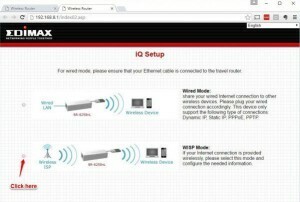 If not already connected, connect your computer to the wireless signal of the EdiMax router. 3. If your browser does not automatically open, open it manually and key into the address bar for the connection screen to appear. 4. 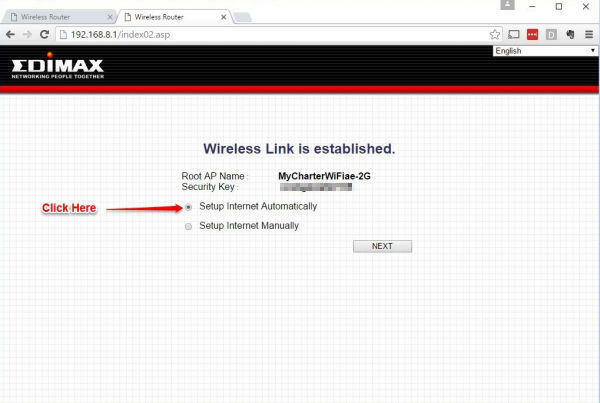 To connect to a WiFi-Hotspot, open or encrypted, click on the Wireless ISP button. 5. After a few seconds, the next screen will display a list of wireless networks. If it does not after waiting a few seconds, just click on the refresh button. 6. Click on the wireless network you want to connect to. If the connection is encrypted, enter the encryption password in the field below the SSID name. Then click next. 7. 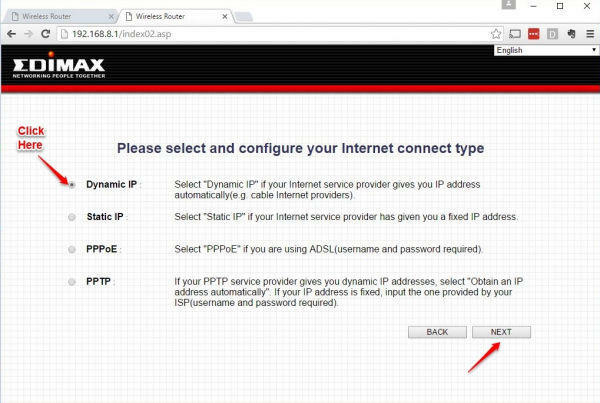 Wait a few seconds again, then on the next screen click on Setup Internet Automatically. 8. 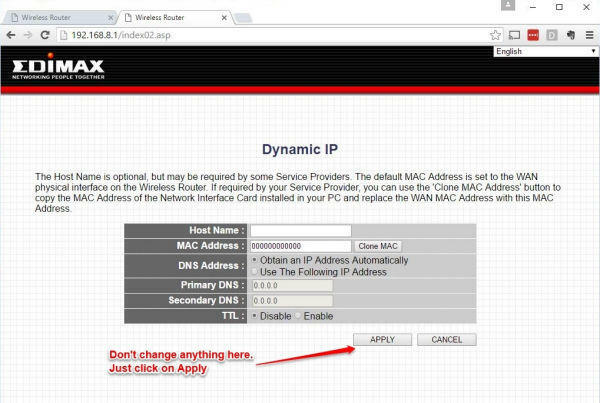 Since most public WiFi-Hotspots are assign IP address dynamically, make sure you have Dynamic IP selected on the next screen, then click on next. 9. On the next screen, for public WiFi-Hotspots, there’s no need to enter or change any of the settings. Just click on the apply button at the bottom of the screen. 10. If all is well, the next screen will display “Congratulations! 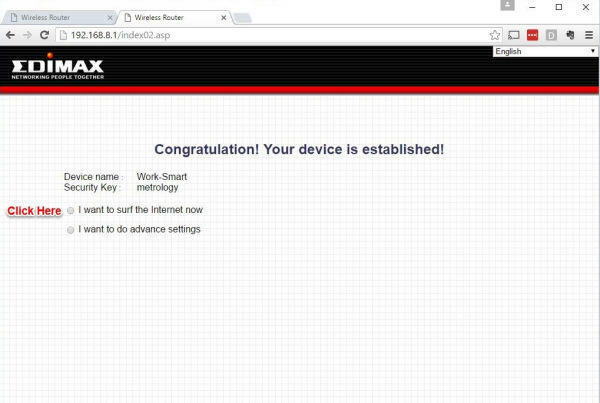 Your device is established” just click on the “I want to surf the internet now” button. Your web browser will now automatically redirect to your default home page or to the Hotspot login page. On clicking on “I want to surf the internet now” button, you may be redirected to a Hotspot login page. 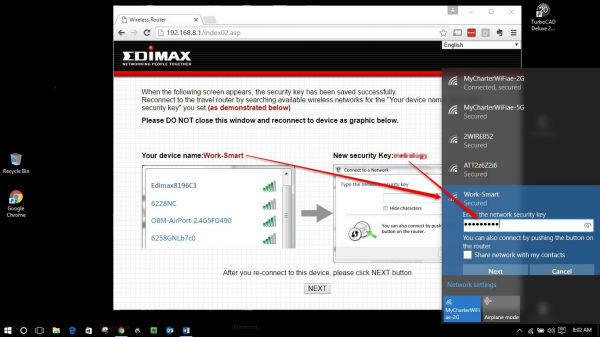 Double check your laptop’s wireless connection to make sure you’re still connected to the EdiMax travel router, and it did not directly log in to the hotspot. 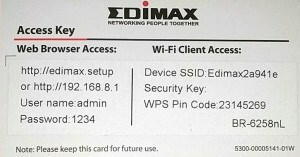 If you are still connected to the EdiMax travel router, log in to the wireless hotspot in the usual way. Your EdiMax travel router is now connected to the Hotspot, and you can share your Internet connection through its own wireless signal with other devices. Just connect these devices to the EdiMax to share the internet connection. Also, each device will be able to see the other in Windows networking as long as they are in the same network group. I found the EdiMax to work very well with my Chromecast and is an excellent alternative to the methods I documented in my article last year. The Ethernet port on the EdiMax does not work when connected to a wireless ISP or hotspot, it’s only used for connecting to a wired internet access. You can buy EdiMax Travel Router from Amazon. Please feel free to make comments or ask me questions by leaving a comment here on this blog post, I will respond promptly. I was looking for a better solution than turning my computer into a hotspot. Thanks so much for this, works perfectly! Hi Nandan, I’m glad it’s working out for you. Thank you so much for reading my blog. ColinR. After the router setup page says you are connected, one of two things will happen depending on the hotspots configuration. 1.) You are automatically redirected to the hotel login page where you can login. If nothing happens, just type into the address bar a known URL I typically use ‘cnn.com’ as its short. When you do this, if a login page is required you are redirected to that page. ok great this is pretty standard for public wifi.. I might be missing something but what about hotel wifi where you are required to login that is the one we need to know about… are you referring to that here? by hotspot logon are you referring to possible hotel hotspot logon pages etc? Yes, your web browser will automatically redirect to the Hotspot login page. When it doesn’t, just type in a known URL into the address bar to force it. Please see my reply to David. Works flawlessly! 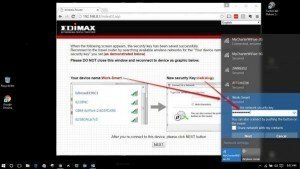 At home I set up my Edimax on my smartphone (you need it on your smartphone to use it as the Chromecast remote), laptop, and Chromecast. At the condo I connected Edimax to laptop, used Edimax setup page to find condo wifi, then logged into condo splash page. Next I connected to Edimax on my phone then plugged in Chromecast. Chromecast looked for Edimax, found it, setup. Now we have Chromecast at the condo! Thank you! I’m glad it’s working for you. Thanks for sharing. I have a seasonal property. And rather than pay for cable and internet year round, I connect to the condo complex’s “free” (but uses XFINITY username and pw). But I’d like my router to connect to this wifi. I heard about wifi-to-wifi routers but found your page, does this device allow my current router to connect to wifi as its “input”? This device won’t, and I found out over the holidays that the EdiMax is no longer available. The device I’m currently testing that will work with your existing router is the GLI Mini Travel Router GL-AR150 available from Amazon. I’ve had this little thing for about two weeks now. it’s a little more difficult to setup then the EdiMax, but so far it appears more capable. I hope this helps, please feel free to post a comment here should you have any more questions. I have always used the NETGEAR Trek N300 Travel Router (PR2000) on Royal Caribbean cruise ships to share the internet. On my last trip they started blocking routers on their network… I guess Netgear MAC addresses. Do you know if the GLI Mini Travel Router GL-AR150 would still work? Thank you for solving this issue. My concern is that I don’t want to travel with a laptop, but want to use my tablet instead. How am I going to re-configure the travel router once I arrive at the hotel?